This weekend, we will embark on a Classic Mediterranean cruise. Every day in port, we’ll play a game of Hide & Tweet - we’ll send out updates via Instagram and Twitter from a secret spot, and the first person to guess where we are will receive a fun gift! We’ll also be co-hosting a live, onboard Twitter chat with Simon of #CruiseChat! Our cruise includes four Italian ports: Livorno (Florence/Pisa), Civitavecchia (Rome), Sorrento and Taormina. Here at Azamara Club Cruises, we’re all about Destination Immersion® experiences. We’re more interested in spending time onshore than onboard, and when we visit a place we want to experience it like a local. So, we did a little research and discovered five ways to embrace “La Dolce Vita” during a cruise. Italians love coffee, and they do it better than almost anyone else. When you’re in Italy, take coffee seriously. Learn the phrase “Un caffè, per favore” before you depart. Order your coffee and stand while you drink it - most cafes charge almost triple if you sit at a table. Drink slowly, but don’t linger. It should only take a few minutes to enjoy an espresso. If you want milk, order a caffè latte (espresso with hot milk) or a cappuccino (espresso and steamed milk with foam). However, Italians only take milk with their coffees in the morning. If you want to experience authentic Italian coffee culture, only order a cappuccino before ten in the morning. In the afternoon and evening, it’s common practice to only have espresso - Italians believe hot milk after a meal will disrupt the digestion process. For a classic Italian coffee experience, visit Sant’Eustachio Il Caffè in Rome. This cafe has been operating since 1938, and brews over 2,000 cups of espresso every day. The aperitivo will change your life. The idea is simple: sit down to have a social drink and, most likely, a complimentary snack before dinner. It’s a more sophisticated “happy hour”, with a focus on socializing rather than getting a deal. It’s also the perfect chance for an intrepid traveler to take a break from sightseeing. If the weather permits, choose an outdoor, sidewalk table. Order a negroni, aperol spritz, or a glass of wine. Watch as the world goes by, marvel at how fashionable Italian women can navigate cobblestoned streets in stiletto heels, or fill a few pages in your travel journal. This is the definition of la dolce vita. As you cruise through Italy, you’ll notice the pronunciations change. Grazie sounds very different in Venice than in Sorrento. Like coffee, dinner in Italy is an art. For many people, lunch is the heaviest meal of the day. However, a dinner out is considered a social event. It should begin late and last hours. The food is important, but so is the conversation. Particularly in the summertime, dinner will not begin until 8:00 p.m. at the very earliest. Expect to see Italian families (with their children in tow, as children are welcome at nearly all Italian restaurants) arrive for dinner at 10:00 p.m.
A full Italian meal consists of five courses. Antipasti, or appetizers. Primo, the first course, is pasta, soup or risotto. Secondo, the second course, is usually meat, poultry or fish. Most people will order contorni, a side dish, or insalata, salad, as well. Finally, dolce, dessert. This could be something sweet, fruit, or cheese. Most Italians will drink wine and mineral water with their meal. After dolce, it’s common to drink espresso or digestivo - a small glass of grappa, limoncello, amara, or other liqueur meant to ease digestion. At the end of the evening, your bill will likely include a cover charge for bread (pane e coperto), and/or a service charge (servizio). This means your tip is included - for good service, you may include a few extra coins when you pay, but an extra 15-20% would be considered not only unnecessary, but uncomfortable. Italians are known for their relaxed approach to life. Instead of rushing through Rome or Florence, trying to check items off your bucket list, slow down and take it all in. Order a gelato, find a piazza, and do some people-watching. Adopt the Italian practice of la passeggiata, the ritual of enjoying an evening walk. Many Italians tend to dress up a little for this, as they stroll through the town center and chat with friends. The main streets of some towns become pedestrian-only zones after sunset. For visitors, this walk is a great opportunity to experience Italian life and do some sightseeing. 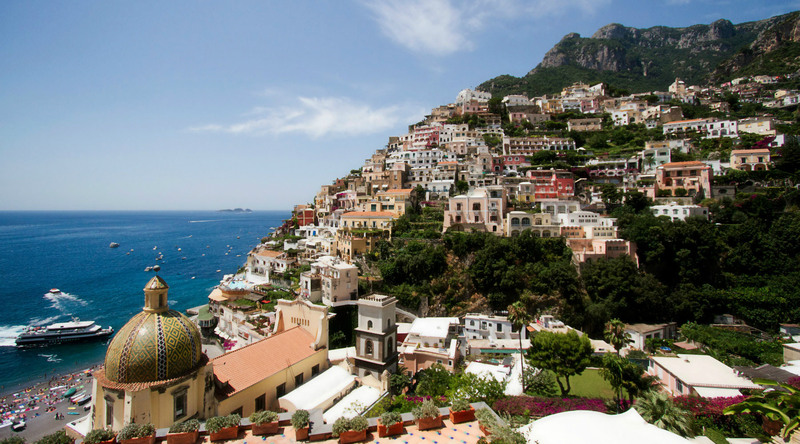 With these five tips, you’re all set to experience la dolce vita during your next Italian cruise! And, don’t forget to follow along as we cruise the Mediterranean beginning this Sunday. Follow us on Twitter and Instagram so you can play Hide & Tweet for a chance to receive one of these cool travel gifts!